HOW WILL MY BABY BE HAPPIER With Beaming Baby Size 4 Diapers? YOUR HAPPINESS GUARANTEED with Beaming Baby Maxi Plus Diapers! 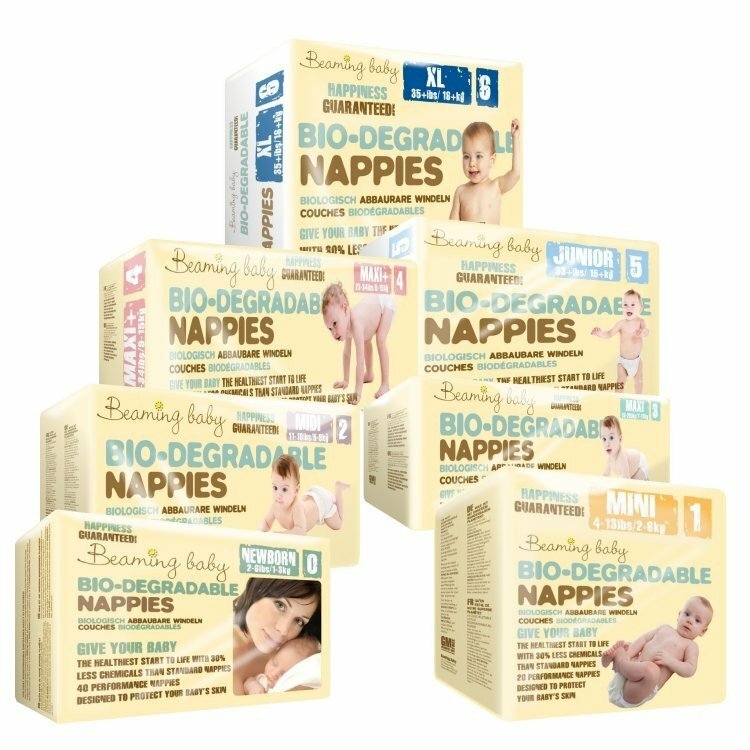 Beaming Baby Bio-Degradable Diapers Size 4 are Totally Chlorine Free and contain only Clean Plastics which are used in the Velcro patch and elasticated back and side panels. "Excellent nappies. I have used them for 3 of my children now and just wish I had discovered you when I had my first child! Absorbent, reliable and not bulky brilliant!" I was looking for an eco disposable diaper after using some fantastic ones in Canada. . I find disposable easier at night. Much more absorbant than regular disposable diapers. I use a size bigger and they last for 11hrs without changing, we all get better sleep. Very rarely wet clothing on waking. We are very concious of the envrionmental impact of diapers and recently our son has grown out of the washable diapers we had. These diapers are the best on the market for value and biodegradability. Our environmental impact is minimsed by using Beaming Baby diapers. I recently bought the diapers and I'm so glad I switched - wish I had done it sooner. My LO is so much happier and can go longer without changing. She doesn't get irritated or feel itchy as she did with the mainstream brand.the BB diaper feels clean without nasty chemicals! Thank you BB. I love Beaming baby diapers. We have been using them since baby was a newborn and continue to get the bigger sizes as he grows. We have never had an issue with diaper rash and I attribute it to using these diapers. I love that they are biodegradable and no nasty chemicals are on my baby! I find these to be excellent diapers that are not only kind to the environment but kind to babies skin too, no diaper rash ever. The diapers hold a lot of wee so there is no need to do any middle of the night diaper changed. Only thing to note is I think the sizes come up a little small, but no problem. My daughter hardly ever had diaper rash with these diapers. We love them, we love the eco friendliness and the customer service is FANTASTIC (they are real people who care). These are excellent diapers for both day and night. Free from leaks and eco friendly too. I'd never buy another brand! Excellent as always. Brilliant diapers, I've used them on my baby since birth (2 years ago). Great product and lovely fit. My baby never gets nappy rash from these diapers. Great service and very eco friendly products. The diapers are very durable and very rarely leak and I feel much happier knowing they biodegrade so much quicker than other brands. More should be done to promote these diapers so people can help to protect our environment. The only point I would raise is that the marketing material we receive with our order is very repetitive and as a retuning customer I would be happy to receive offers just by email rather than as a paper flyer. I have used these since my little one was born 18 months ok. Find them great. No diaper rash. Really happy with this product. Highly recommend - in fact, I have! to all my friends. This is an amazing company that supply amazing diapers can't recommend them enough. Excellent product for sensitive babies, cant fault at all. We are very conscious of the environmental impact of diapers and recently our son has grown out of the washable diapers we had. These diapers are the best on the market for value and biodegradability. Our environmental impact is minimsed by using Beaming Baby diapers. Love these diapers that I use at night and when we're out, in addition to my washable diapers. They don't have the nasty chemicals in that the usual diapers do so don't hang down ridiculousy as they get full. They also have a lovely chamomile aroma (prior to filling!). Great diapers. Do the job! Love these diapers. They do everything I like, they're eco friendlier than conventional diapers, they smell lovely, and they don't leak on my 5 month old daughter or my 2 year old son, not even 12 hours overnight! My son loves these, he calls them his "special ones" and now won't let me put on anything else! He really likes the bug characters on them. From my point of view, they are soft, don't leak and are easy to put on (because my son happily lies down to put them on instead of running away!). My grandson had a nasty rash on his legs where his old diapers gathered. We changed to beaming babies and the rash has now gone. I would definitely recommend to others. Would be good if they could be a bit less expensive, other than that perfect they keep the baby very dry also. Best protection against leaks - I love Beaming Baby! I can't put my baby in anything else, they have the best protection against leaks that I've found! I love beaming baby diapers. It's great to know most of our diaper waste will be gone in a few years! The diapers are really good actually, they last a while too! So far no rashes and the one he had before starting him on your diapers is disappearing! hurray! Beaming baby products are fantastic! My son has only had diaper rash once, and that was when we ran out and had to buy in the supermarket! These are really good and up until recently we could use them overnight. Unfortunately the baby is bigger and has reverse cycled, so he drinks more milk over night, so we've had to move to a more traditional brand with more jelly beading for over night. Still love these for daytime use. I like that they are unscented and feel more natural and less destructive. My son is almost 7 months old and has never a had a diaper rash or had any diaper cream applied. I have been using beaming baby diapers since birth and the wipes since he was a month old. I sought out this product as it was biodegradable and therefore eco-friendly which is very important to me. A natural, chemical free product is also important and the added bonus that these diapers cause no diaper rash, is just amazing! I recommend these diapers to everyone. The customer service and postage is fantastic. Thank you for caring about the environment and our babies. No diaper rash. I love the fact that they are more biodegradable than usual as well, so not contributing to landfill. Good product - though these diapers are expensive. Good if pricey - but in our experience they do dramatically reduce diaper rash, as well being more environmentally friendly. simply perfect! we love them! I love this diapers! they are the best! delicate on the skin but they hold perfectly overnight! Excellent products. My baby has never had a diaper rash. I dont feel so guilty when filling the bin with diapers because i know they are biodegratable. Since my baby girl was born , had problems with the diaper irritation. I was spending so much money on Pampers day and night ones... Super Drug ones... I think they called ...Little me. More chemicals on my baby skin...of course that's why she had this diaper rash. I didn't care ow much will spend ... I just want my baby bottom to be dry and no irritation!!!! And then in one day a new friend of mine gave me to try one Beaming Baby diaper. She told me that I will be happy. So what I've done... I washed my baby... and played for a while ... until no more diaper irritation was visible. And on dry skin I put on the Beaming Baby diaper. Left it on for 3 hours ... and Ta -daaaaa!!! Beaming baby has great products you won't find elsewhere (especially diaper and wipes). The service is impeccable and they provide nice information and promotions. It's wonderful to see an health and environment friendly, affordable, and modern solution to all parents. I recommend them fully! these have been brilliant, no leaks! The diapers are fantastic along with wipes and diaper cream and diaper sacks. Great quality diapers with no nasties! I bought the diapers for my grand son and he has never had any problems with diaper rash.